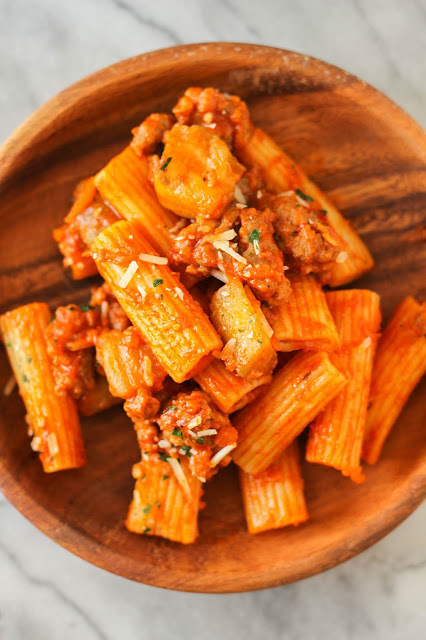 Italian sausage, eggplant, and Parmesan cheese come together in this quick and easy hearty pasta dish! We all know how much I love pasta, and it's been quite awhile since I shared a new pasta recipe. Well, it's about time I change that! 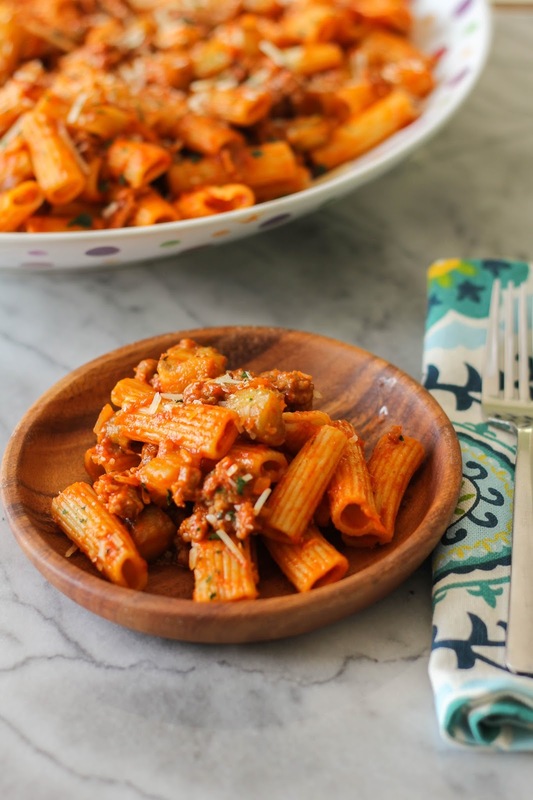 I've been experimenting with different combinations and flavors, and this Ziti with Eggplant, Sausage and Parmesan is my new favorite. Other than traditional eggplant parm, I've never cooked eggplant in a pasta dish before. Once I tried this dish, I realized I had really been missing out! The cubes of eggplant turn soft and tender, and the their flavor pairs perfectly with the Italian sausage. Thankfully my kids loved this dish as much as I did! My youngest wasn't quite sure about it as first, telling me he didn't like eggplant, but once he had a few bites he quickly changed his mind. Combined with the marinara, sausage and Parmesan cheese, the eggplant is not overwhelming at all. 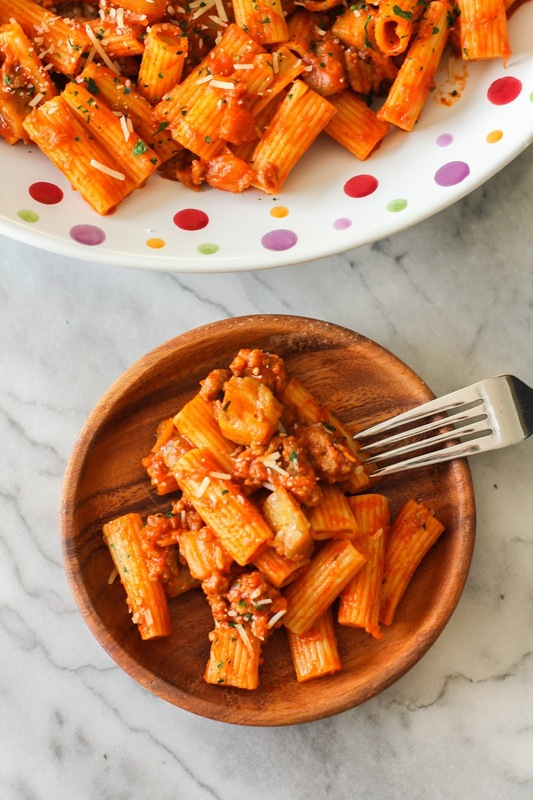 This pasta dish is simple to make and comes together quickly, making it perfect for a weeknight dinner. Pair it with a nice side salad and some breadsticks to round out your meal. 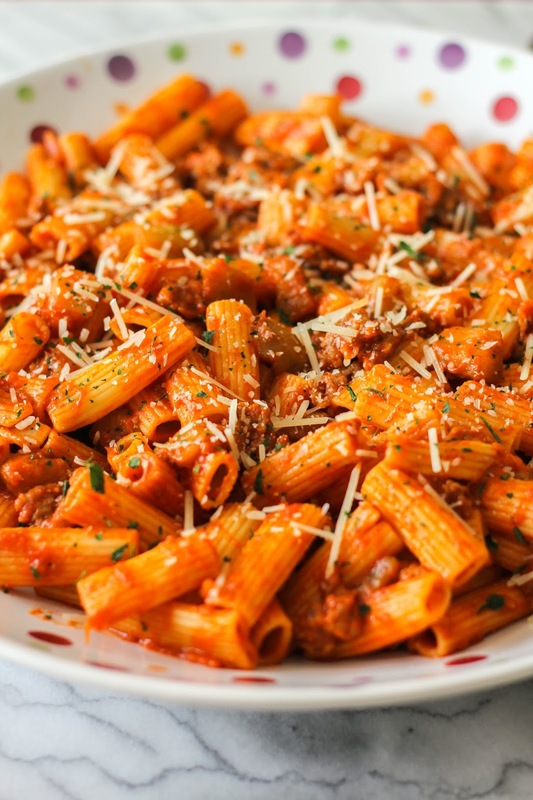 Are you ready to try this delicious pasta dish for yourself? In a large skillet, cook the eggplant, sausage, and garlic over medium-high heat until the sausage is browned and the eggplant is tender. Add the marinara, oregano, pepper and red pepper flakes, and cook over low heat for 10 minutes, stirring occasionally. Remove from the heat and add 1/4 cup of the Parmesan cheese and mix gently to combine. Place the cooked pasta in a large serving dish and add the sauce, tossing gently. Sprinkle the remaining 1/4 cup of Parmesan cheese and the parsley over the top of the pasta. Serve immediately.